Federal income tax withholding (based on withholding tables in Publication 15). Social Security tax withholding (6.2 percent up to the annual maximum taxable earnings of $127,200 as of 2017). Medicare tax withholding (1.45 percent). Additional Medicare tax withholding (0.9 percent) for employees earning over $200,000 (this is a new tax withholding requirement starting in the year 2013). Various local tax withholdings (such as city, county or school district taxes, state disability or unemployment insurance). Health insurance premiums (medical, dental, and eye care). Retirement plan contributions (such as a 401(k) plan). Employee stock purchase plans (ESPP and ESOP plans). Meals, uniforms, union dues. and other job-related expenses. Voluntary deductions can be paid with pre-tax dollars or after-tax dollars, depending on the type of benefit that's being paid for. Some pre-tax deductions reduce wages subject to federal income tax, while other deductions reduce wages subject to Social Security and Medicare taxes as well. IRS Publications 15 and 15-B explain which benefits are pre-tax for various purposes, and professional grade payroll software will help you keep track of all tax-related payroll calculations. Paying the employer's share of payroll taxes. For depositing tax dollars withheld from the employees' paychecks. Accounting for the payroll expense through their financial reporting. And filing payroll tax returns. As of 2013, an Additional Medicare tax is applied to employees who file taxes as head of household, single or as a qualifying widow(er) with a dependent child and whose Medicare wages exceed $200,000. The threshold is much lower for married individuals who file separate tax returns: $125,000. The Additional Medicare tax applies to income over $250,000 for married taxpayers who file joint returns. This is an employee-only tax. There's no corresponding tax imposed on the employer. The employee portion of Social Security has increased from the 4.2 percent it was set at in 2011 and 2012. That payroll tax holiday was legislated as part of the Tax Relief Act of 2010, which was then extended by HR 3765 and extended again by HR 3630. But the employee portion of Social Security reverted back to the full 6.2 percent in 2013. Annual federal unemployment tax return (Form 940 or 940EZ). Employer's quarterly payroll tax return (Form 941). Annual Return of Withheld Federal Income Tax (Form 945). 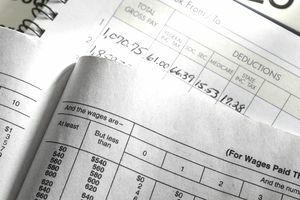 Wage and Tax Statements (Form W-2). Employers also have requirements to file reports with various state and local agencies. Employers can find links to state tax agencies through the American Payroll Association website. Originally written by Diana Van Blaricom, a certified Professional in Human Resources (PHR). Edited and revised by Beverly Bird.